The Mekong Delta is sinking 2.5cm every year because of ground water extraction and unreasonable planning and constructions on the surface. The problem was discussed at a conference about sinking threat and solution for the Mekong Delta on March 21 in Can Tho City. According to the results from Rise and Fall Project held by Can Tho University and Utrecht University in Netherlands, many rural lands have a subsidence rate of 10-20mm a year, this rate is 25mm in urban and industrial areas. According to Piet Hoekstra, head of the project, the subsidence rate at some locations were 2-4cm a year, mostly in the coastal and low-lying area. Some locations have sunk 25cm in the past 25 years. Nguyen Hieu Trung from Can Tho University said the subsidence rate in the Mekong Delta has sharply increased in recent years. There are four main causes for the subsidence including natural subsidence, tectonic process, pressure from surface constructions and groundwater extraction. Groundwater extraction, which has drastically increased over the past decades due to growing demands, is considered the main cause. Statistics from the National Centre for Water Resources Planning and Investigation show that a total of five million cubic metres of underground water is being extracted each day and the number is still rising. The water level has dropped to only 10m in Hai Hau District, Nam Dinh Province and 18m in HCM City. 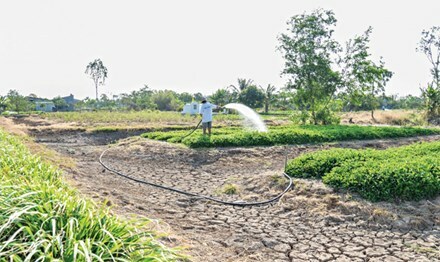 Tran Van Thanh, deputy head of Soc Trang Province Department of Natural Resources and Environment, said most water plants in the province were extracting underground water. Only one plant uses surface water but it is being turned into saline water. The province has implemented various measures, stored rainwater and reduced the dependence on underground water but they still have many difficulties. "Farmers use underground water to maintain their shrimp and fishing farms. During dry season, they drill wells to water rice crops," Thanh said. According to Piet Hoekstra, the exploitation rate is much higher than the renewing rate. This water source may have been formed 20,000 years ago and is being threatened by both human and saltwater intrusion. Ky Quang Vinh, director of the Climate Change Coordination Office, said the renewing process for underground water was time-consuming. Japan issued a ban on underground water, oil and gas exploitation around 1985 but only by 2000 that the water level started rising. "We have to act now or else we'll be decades behind," Vinh said. Can Tho City authorities have banned extracting underground water but it will be useless if other locations still allow this activity. Vinh said the Mekong Delta must fight against drought and saltwater intrusion at the same time. Vinh suggested dredging the existing channels and canals to enlarge their capacity to store more rainwater and helping renew underground water.